I’m scratching my head. I’m a well traveled, adventurous woman. 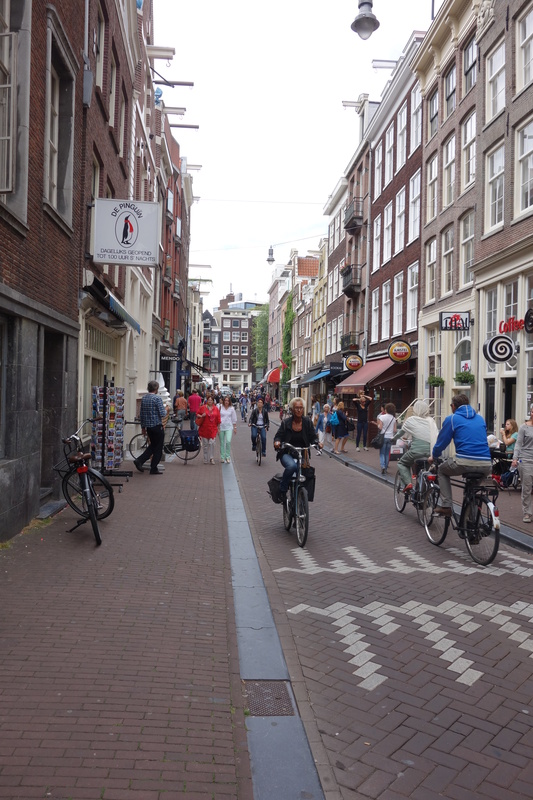 Why haven’t I been to Amsterdam before? This is a city that is tailor made for me – everywhere is walking distance, stunning art galleries, chilled vibe and more importantly, a cheese loving populace. My home for my quick visit was the seriously stylish Andaz Amsterdam, located on the edge of the funky Nine Streets area and frankly, one of the most fabulous hotels I have stayed in. 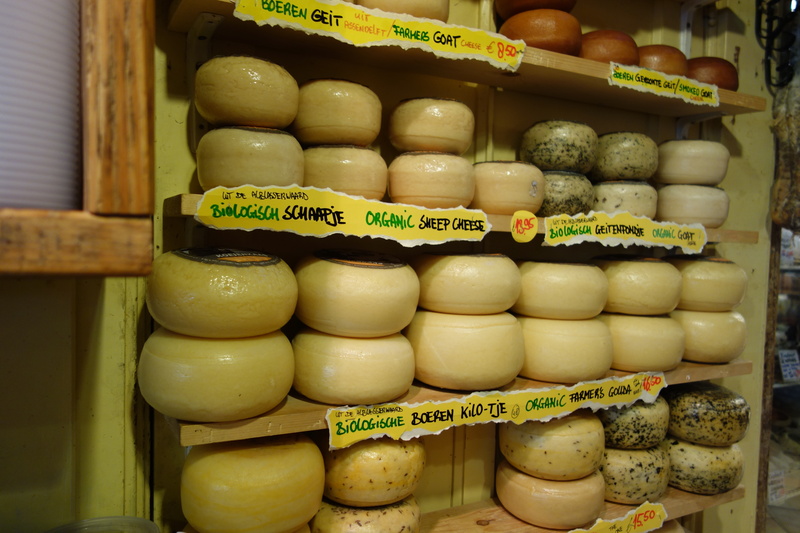 The Netherlands is not known for its cuisine, but it is known for its cheese. Gouda to be more precise. Now I have been scornful of this cheese in the past, until I discovered there is more to than the supermarket version we all know. The cheese is named after the Dutch city of Gouda, not because it is produced in or near the city, but because it has historically been traded there. 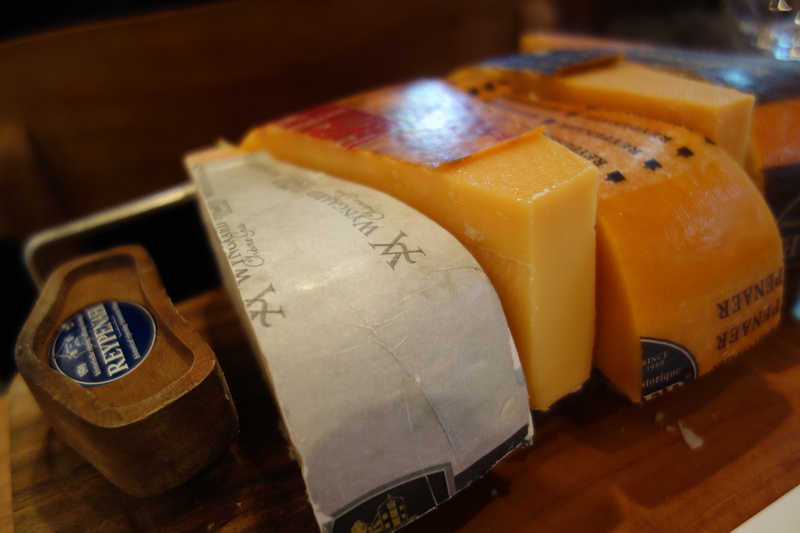 Gouda usually refers to the massive wheels of cheese we associate it with. I was booked into a cheese tasting held by Reypenaer at their store in Amsterdam. The tasting, which proved popular with solo travelers like me as well as oddly a stag party from the UK, took us through the makers’ five different versions of Gouda with matching wines. Reypenaer Cheese is produced by a small cheese dairy according to a traditional method and ripened in its unique micro-climate of a 100 year old warehouse in Woerden about 90 minutes from Amsterdam (yes I did consider going) that allows for natural variations in temperature and humidity. 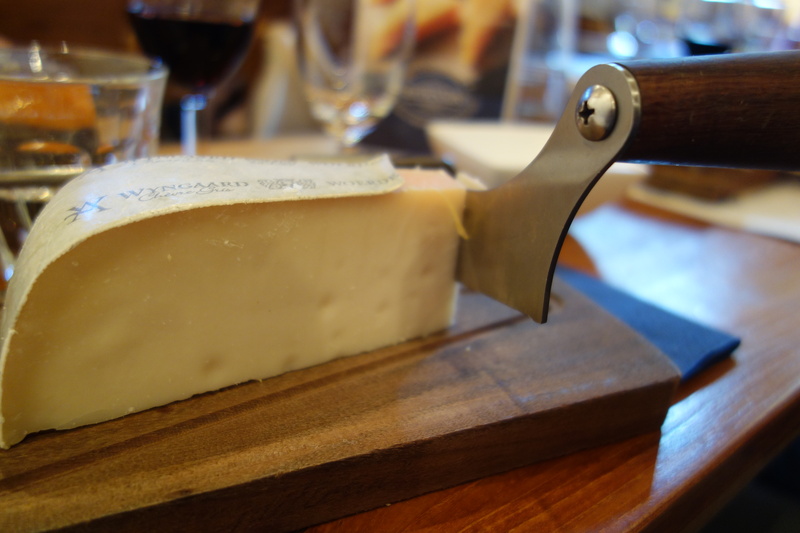 Cheese and sharp implements – heaven much? 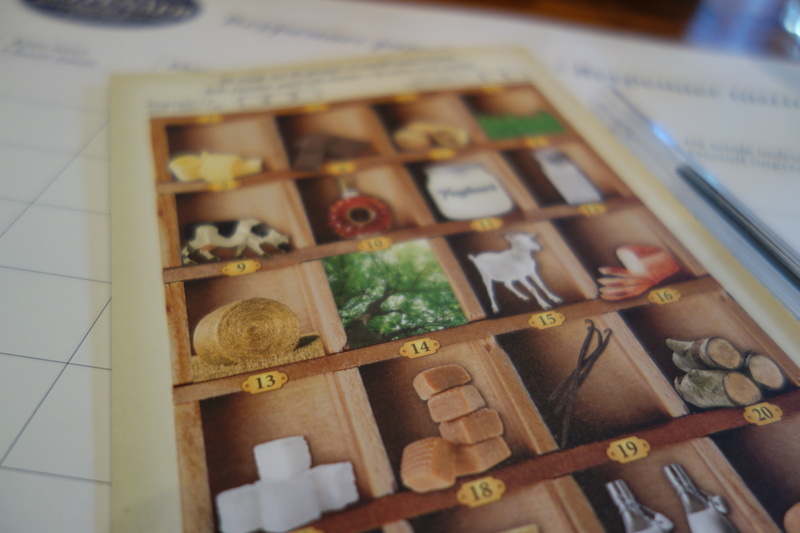 We learned how to “judge” the cheese through looking at its’ appearance as well as how tastes – identifying flavors like caramel just like tasting a wine. And I learned one important thing, nearly 90 percent of a cheese’s taste and favor comes from the environment it is matured in. Gouda cheese is so much a part of Dutch culture and life. It is eaten at all occasions from breakfast through to dinner. As it ages, it develops a caramel sweetness and has a slight crunchiness. I learned more in an hour than I have in six months of doing this blog. 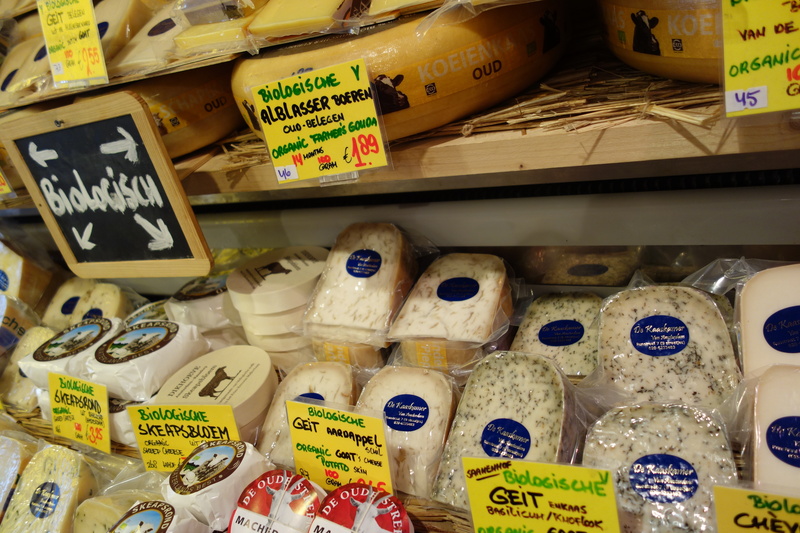 Amsterdam has cheese shops on every corner it seems. This is a city that loves its milk products. 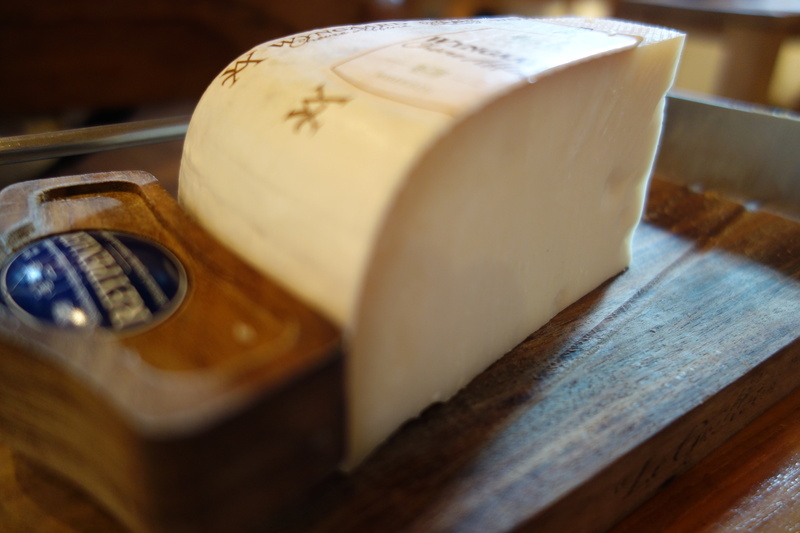 One near the hotel specialized in organic cheeses as well as the local delicacy. As I said, this country is not known for its culinary prowess. But I did have a chance to sample some of the nation’s more interesting offerings. This is a country that loves a snack as well as a condiment – as I discovered when I found myself hungry and hanging out. I asked the guy selling this from a caravan what I should put on my hotdog – he said, “everything”. 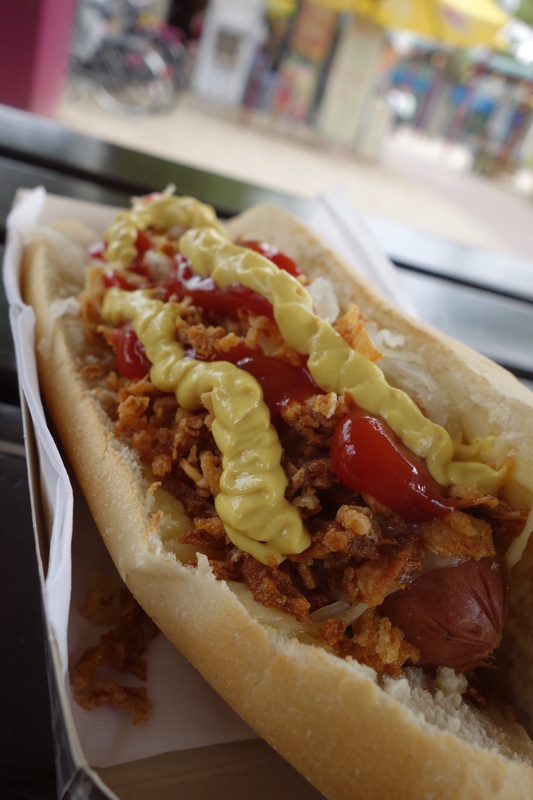 Hence I ended up with crunchy fried onions, mustard, a type of sauerkraut and a bunch of stuff I can’t remember. This snack, a sort of minced-meat hot dog, was developed either in 1954 or in 1958/1959 in the Netherlands, depending on who you ask. It is a long, skinless, dark-colored meat sausage which is usually eaten on warm to hot temperature. 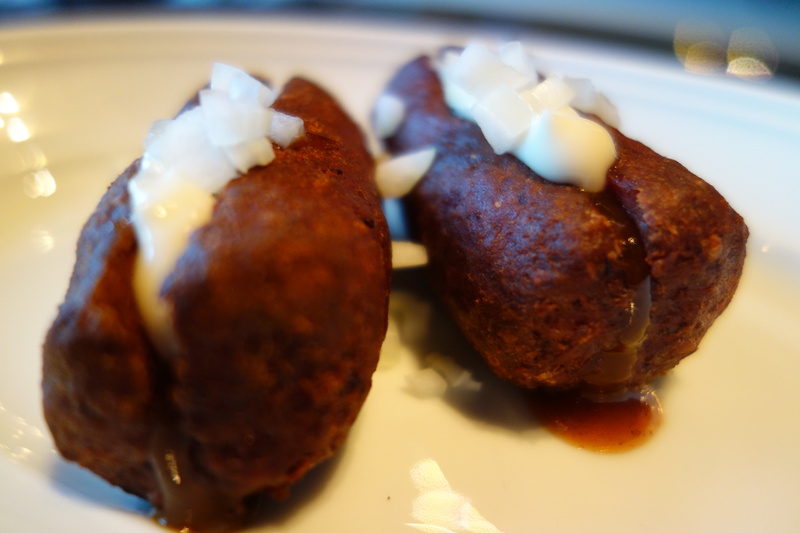 Unlike most sausages, the frikandel is deep-fried, then cut open and filled with curry ketchup and/or mayonnaise as well as chopped onions. According to the AKSV (the General Association of Manufacturers of Cooking Supplies and Snacks in the Netherlands) 600 million sausages are produced each year in the Netherlands. Most of these are also sold in the Netherlands which results in more than 37 sausages being consumed per capita per year in the country. I suspect the awesome snacking culture in Amsterdam is fueled by their love of the hop aka beer. 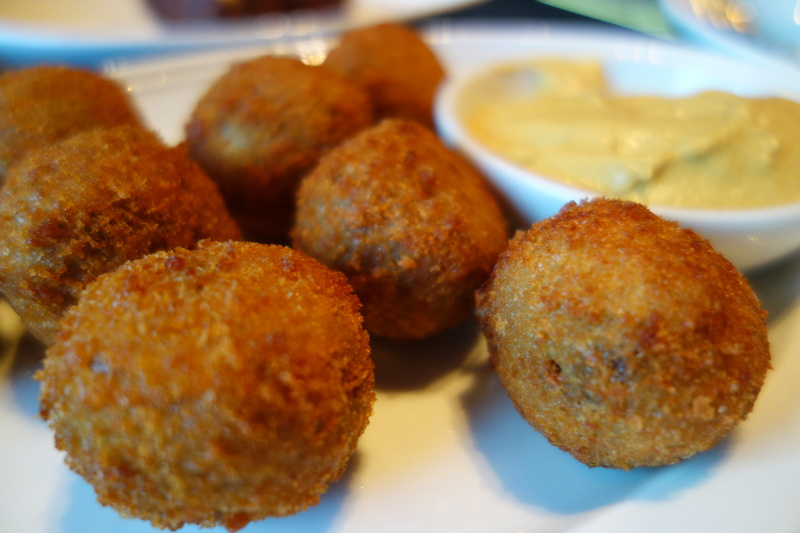 The king of the Dutch snack is the Bittenballen. This meat-based snack, typically containing a mixture of beef or veal (minced or chopped), beef broth, butter, flour for thickening, parsley, salt and pepper, resulting in a thick ragout. Most recipes include nutmeg and there are also variations utilizing curry powder or that add in finely chopped vegetables such as carrot.The ingredients are combined and cooked, then refrigerated for the mixture to firm up. Once firm, the filling is rolled into balls then battered in a breadcrumb and egg mixture and deep-fried. 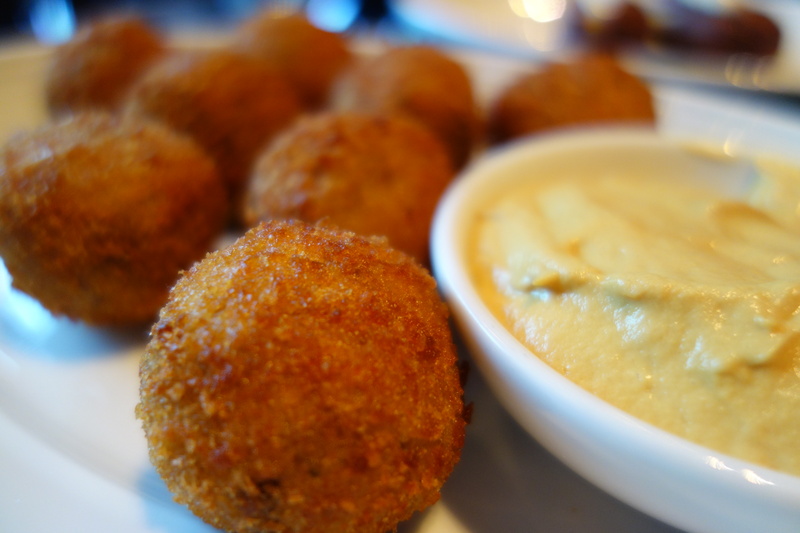 They are typically served with a ramekin or small bowl of mustard for dipping. If they can be described in one word? CRACK. Seriously addictive. 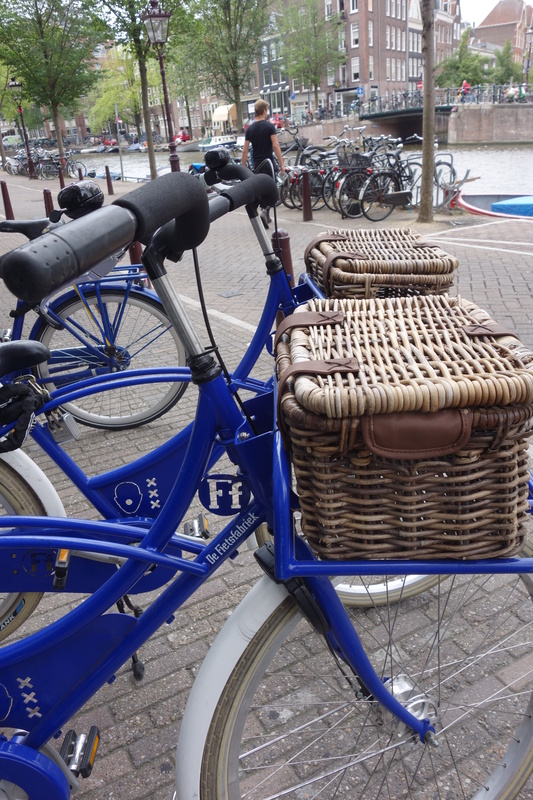 A bit like Amsterdam! Such fantastic, drool-worthy shots. You’ve convinced me to change my opinion about gouda as a boring cheese.